Would you believe that a single blog post could generate over $2 million in sales? 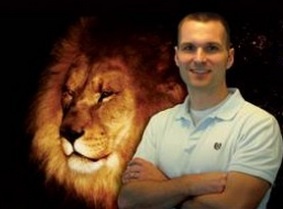 Before he became The Sales Lion, Marcus Sheridan sold pools for a living. These pools that were major 5 figure assets not oversized plastic tubs on your front lawn that your kids splashed in. They pools provided recreation and enhanced property value over time. From a cost perspective, a pool involves the investment building the pool and surrounding support and landscape. Additionally, it involves on-going care and maintenance. More importantly, these pools have a positive impact on the value of your home. This means that some of the money you invest is returned when you sell your home. Given this type of long-term investment, what was the BIGGEST question Sheridan’s prospects had? How did Sheridan know this was their biggest question? Because it was ALWAYS the first question prospects asked. It doesn’t take a rocket scientist to figure this out because price qualifies your prospects. Price is the most common question customers have about any product! Afraid to loose prospects, his competitors never addressed this question online. This is a perspective shared by many small businesses. Many small businesses don’t want to post their prices since they’re afraid that they’ll loose the sale. Sound familiar? Pricing is hard but not for Sheridan. He gave prospective buyers a detailed response to their most important question on his company’s blog. Since this is the only article that answers this key pool buying question, it gets lots of search traffic. 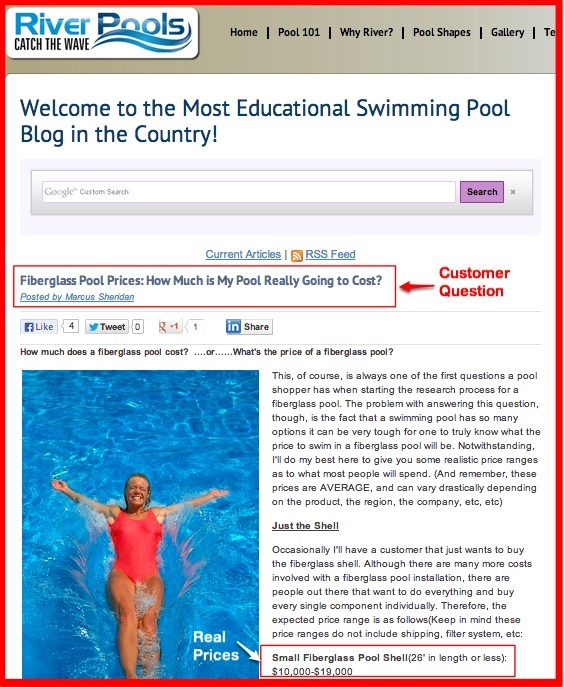 Entitled “How Much Does a Fiberglass Pool Cost?”, the blog post has generated over $2million according to a tweet Sheridan made on #BlogChat a few weeks ago. While $2 million in sales sounds like a lot of money, simple math shows they sold between 24 and 57 pools based on Sheridan’s price range. Sheridan outlined all of the many categories of pools and related products that a pool buyer needed to consider along with their price ranges over the expected life of owning a pool. His list included products that his company didn’t even sell. This information built Sheridan’s credibility and provided context for a better informed decision. It also changed the price decision from a first cost in year one to the total cost over a number of years. In the process, Sheridan neither gave away the store by pricing his product too low nor scared away prospects with prices that were too high. Instead, he examined the major types of pool his target market purchased to set his pricing. Sheridan changed the sales process. He calls this the secret sauce of blogging. Included all of the product options. He included products his firm didn’t sell. He explained all of the different elements they needed over the course of the years of owning their pool. This included pool, installation, related construction, on-going maintenance and longer-term maintenance and replacement needs. Provided a price range. Sheridan’s company was experienced at pool installation. Based on this experience, he knew about what a pool would cost his firm and a client. What did Sheridan gain by answering this question? Increased qualified leads (aka lead quality). Prospects spent time reading his information. According to Sheridan’s forward to Jay Baer’s Youtility, in 2011, the average visitor to the River Pools and Spa site who read 30 pages or more before filling out the content form. If you’re not going to spend the money it takes, then you’re not going to call him. Reduced sales cycle. Sheridan no longer needed to educate prospects during the sales visit and return to answer more questions. If you called him, you knew what you wanted and cut to the more specific questions. Improved the close rate. By providing this information, Sheridan had an 80% chance of closing the sale compared with the pool industry’s 10% average. This means more sales with less marketing and sales expense, thus higher profitability. “They ask, you answer.” Tweet this. Research shows that both B2C and B2B shoppers research purchases online. Most B2B shoppers are 70% through the purchase process before they contact you. Break your offering into chunks. Re-imagine your product or service. Put it into a context your customers understand. Divide it into separate elements or aspects of a process and explain them in terms your audience understands. It’s not about you, your product or your company. Offer a price range. Base your estimate on your experience and your competitors. Sheridan doesn’t tell you exactly what your pool will cost. Granted this doesn’t necessarily work for every product. If you’re selling the exact same hard goods that every one else does, then this may not work. Market unto others as you would have them market unto you. Tweet this. What has your experience been using content marketing and your blog to answer your customers’ key questions? Help with costs in plain English. Tags blog post, Derek Halpern, Marcus Sheridan. Bookmark the permalink. Love this post & blog! Bravo to Marcus for taking the insights he gained from his customers and using it to his advantage. He humanized his company/brand by giving a genuine, thorough answer to one of the most common questions. Oftentimes, companies try to avoid answering the obvious, but the results from this blog show how beneficial this can actually be for your company’s bottom line. And I thought you were about to say affiliate links. It’s good to know that blogging still makes money;) Definitely for this guy. I wonder if it was his main page in which he directed advertisement? Sheridan didn’t use advertising to the best of my knowledge. He used his firm’s blog to answer everyone of the customer questions. He created a book to help buyers.